You are currently browsing the tag archive for the ‘Charles R. Knight’ tag. 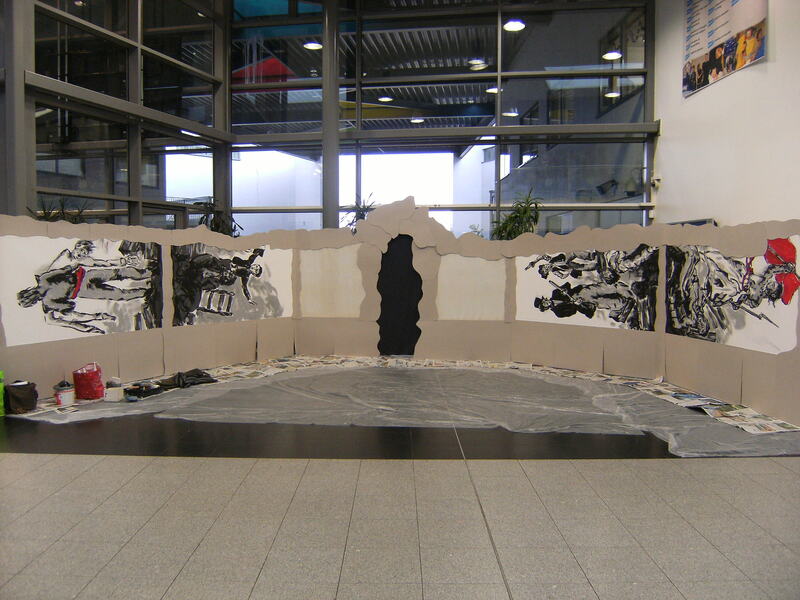 An area in the entrance to the Academy had been allocated as the location for the ‘cave’ painting which, because of its situation alongside the busy concourse referred to as ‘The Street’, would be passed by all students attending the school at break times and as they moved between classrooms. Progress of the project would therefore be easily monitored and assessed by everyone. Work began on Friday 29th November. When I arrived Academy technicians Arthur & Liz had already begun erecting a structure using materials which had previously been used as the backdrop for a production of ‘Les Miserables’. Although the image of ‘Liberty Leading the People’ after Delacroix would be painted over I saw this initial starting point as possibly being a lucky omen. ‘Suddenly’ ‘I Dreamed a Dream’ that everything would turn out okay ‘At the End of the Day’. 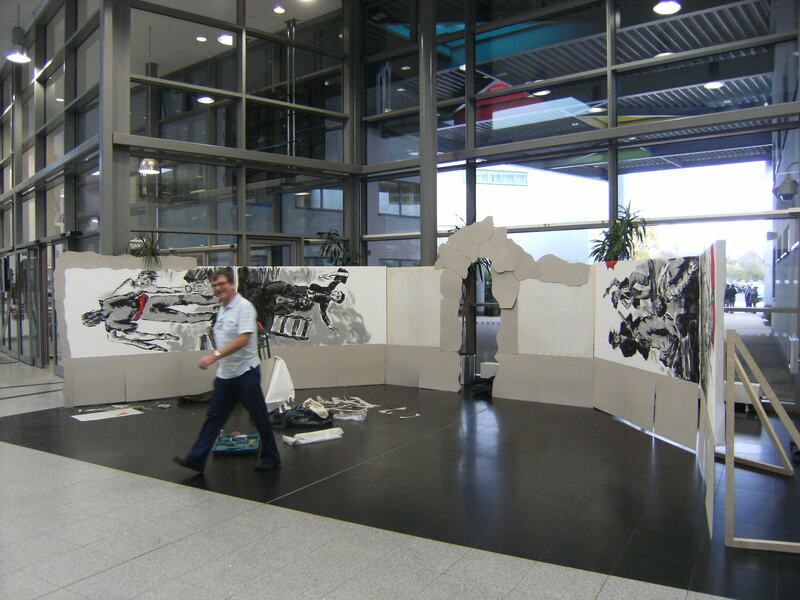 After the flat 8’x4′ and 4’x4′ panels had been installed and connected, sheets of cardboard were stapled to their bottom edge in order that they reached the floor. More cardboard was attached after being torn into irregular strips to prevent edges appearing straight and formal, and I began the task of painting to create the illusion that the surface might actually be rock rather than canvas and cardboard. 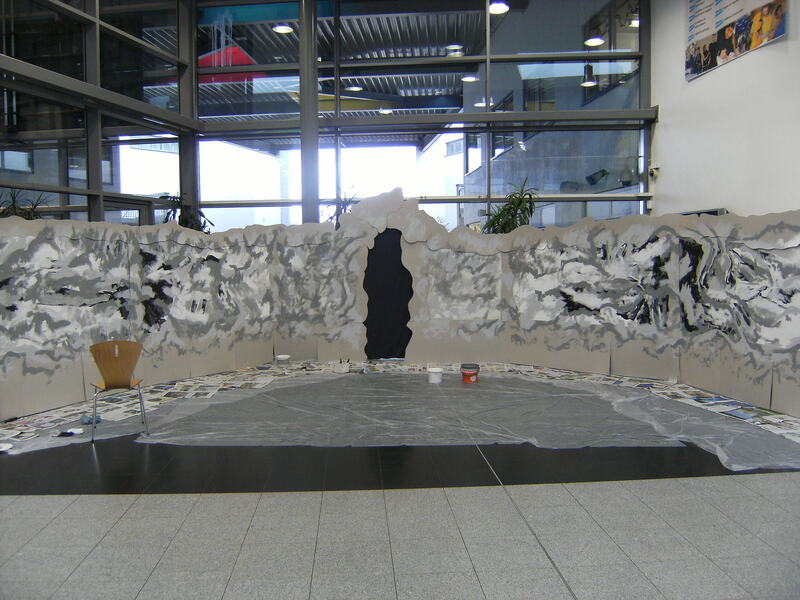 On Monday 2nd December I began working with small groups of year 8 students to paint the ‘cave’ wall. During the course of the week I worked with 10 different groups, each spending just under 2 hours with me. I began each session with a 5-10 minute introduction, showing images on my MacBook, to compare the painting of the Sistine Chapel with the cave in Lascaux, contemporary rock paintings in Australia, cave paintings of hand prints, figures and animals, work by Charles R. Knight, and also Pablo Picasso, in particular his series of etchings of a bull which was manipulated and abstracted in 11 stages. Lastly I showed some images by contemporary artists such as Banksy, and Laurel Barbieri. Each group worked in both two and three dimensions. 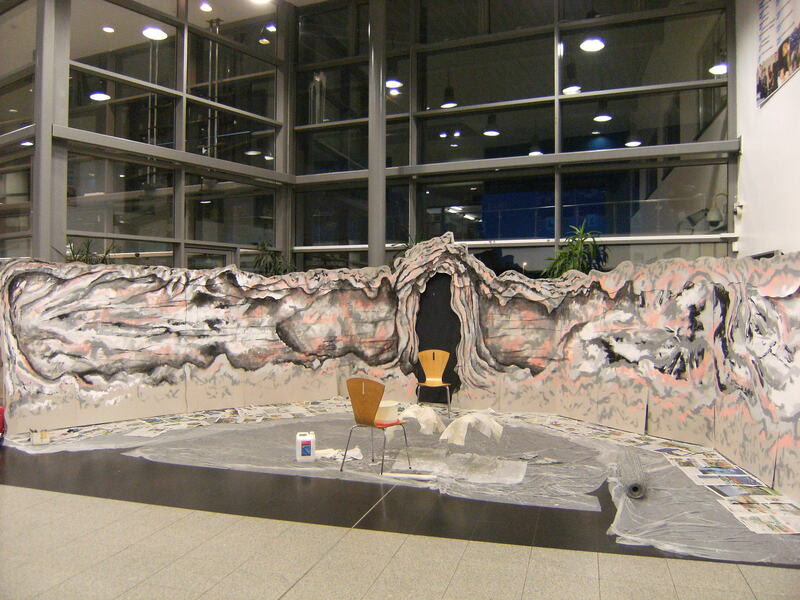 To improve the appearance of the cave further, large shapes were constructed using chicken wire and which were then covered with newsprint and paste. 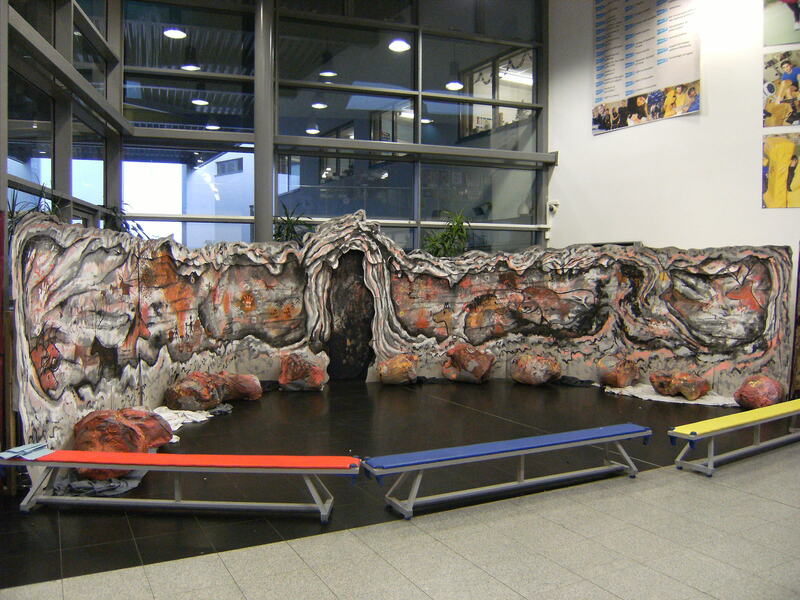 Once dry they were painted to represent rocks and boulders. The cave wall itself was painted with hand prints as well as being decorated with shapes of animals, and figures hunting and dancing. 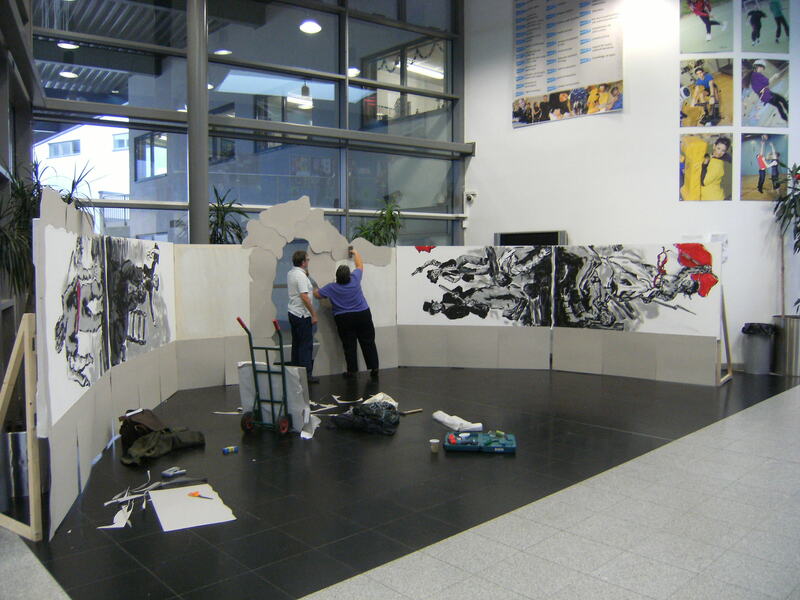 By lunchtime on Thursday 5th December, the painting came to a conclusion and the working space cleared and cleaned. A painting measuring approx. 7′ x 45′ had been constructed, prepared and completed in 5 days which was pretty good going. In the evening, to an invited audience of special guests and parents, the ‘Does Art Matter?’ themed project work and artwork went on display, with a performance of music and dance using the cave painting project as an impressive backdrop. Many thanks Lindsay, Paula & Sara – it was a lot of fun. And well done year 8!! !